The all important contact information can now incorporate the standing stud’s logo and corporate colours to put the icing on the cake. STALLIONS 1989 pioneered the presentation of stallion information with a colour photo and 5 generation pedigree table in an easy to read format on one page almost three decades ago, with various improvements being made over the years. However, it has become evident that there is simply not enough room on one page to present crop analysis, sales summary and a short stud message as is now appropriate (our crop analysis has appeared in a separate section with other statistics at the back of the book). With the assistance of our data supplier Arion Pedigrees we feel confident in taking this next step in the presentation of information on behalf of stallion owners. We firmly believe that it will save broodmare owners time in researching matings and help to give a more complete picture in one easy view. 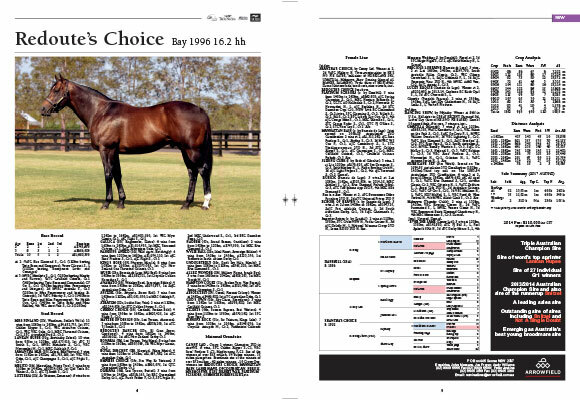 Samples of an entry for last season’s champion sire Redoute’s Choice, Queensland stalwart Show A Heart and Victoria’s freshman Fiorente are set out in this booklet to give an indication of the new style. Jenny Churchill and Andrew Reichard, the editor and publisher of STALLIONS 2017 and the entire team at Bluebloods look forward to being able to present your stallion(s) in the best possible light for their next season and would also like to thank all our clients for their support over the past 27 years. We look forward to the new era with you. To see a sample of what the 2017 entries will look like click here. All these reports are updated daily by Arion pedigrees. Note for Freshman stallions grandsire reports will be substituted in some reports.